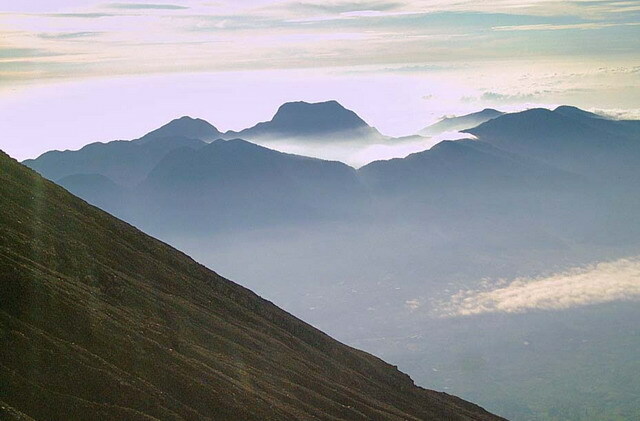 Gunung Tujuh Lake from Kerinci Mount. 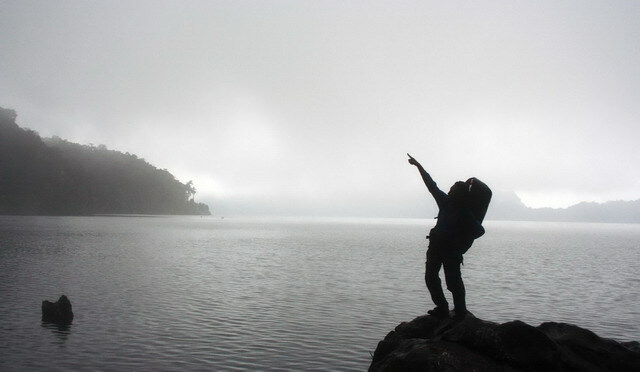 From the top of Mount Kerinci, I witnessed a large lake in the middle of the mountain. The lake is very wide, like a giant bowl whose top is irregularly shaped. The thin fog slowly disappears and makes the lake even clearer. 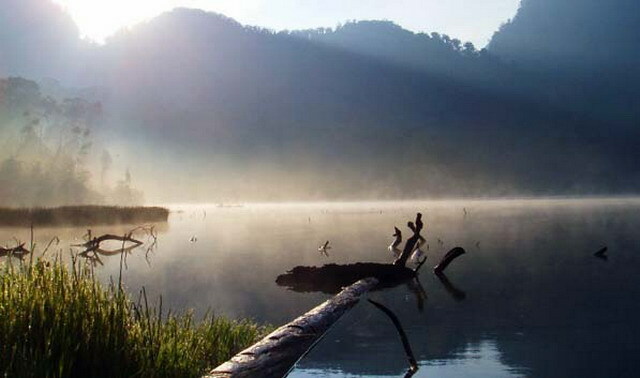 It is said that people call it by the Gunung Tujuh lake. Called the Gunung tujuh (seven-mountain) because there are 7 mountain peaks that surround the lake. With a lake height of 1950 m above sea level, so the seven mountain in the lake made the highest and widest in Southeast Asia. A thin mist over the tea leaves of Kayu Aro plantations greeted the morning. The fried duck that became the traditional food there became our breakfast menu. The overnight cluttering equipment was neatly laid back in the backpack. Now is the time for us to hurry to Pelompek. Pelompek is a cool little village on the slopes of the Gunung Tujuh. In this village becomes the entrance of climbing and entering the National Park Kerinci Seblat (TNKS). Today we will climb the mountain with seven peaks and wade lake 960 hectares, 4.5 km long and 3 km wide. The mountaintop is not our climbing destination, but there is one hidden location we want to go to. At afternoon we started the climb. Our schedule, until the lake, is at 18.00. The journey to the edge of the lake begins by passing through the farm. 1 hour later the journey will continue to enter the tropical rainforest area. Primate voices are heard clearly and become indicators, the forest is still in good condition. At 18.00 we reached the ledges of the Lake. We then walked to a small hut where locals fisherman. We convey our intent and purpose to go somewhere across the lake that is named Pasir Putih (white sand). The Pasir Putih is located across the lake close to the highest peak. We rode a small canoe that was only enough for 3 passengers. Our backpacks are set at the end of the lair and we ride in the middle. In the dark night, we crossed the middle of the lake as deep as 144 m. A thick fog came and blocked the view of the captain of the canoe. We just stick to our direction and our instincts. 2 hours we boarded the boat, we finally landed and immediately set up a tent for camping. At 21.00 you are camped in Pasir Putih. Pasir Putih is the edge of a lake full of white sand and similar to the beach. Tonight we camp here and rarely people camp here. The night was getting dark, and we were getting quieter inside the tent. There were strange noises running around the tent. Sometimes the sound approaches, sometimes away. Sometimes there are footsteps and a sizzling sound. Tonight we want to get out of time that really scares us. Maybe that night I was the only one who dared come out to check around, but nothing. Finally, our fears are over. We can welcome the morning, the sound of sweet birds, romantic fog, and warm sunshine. This morning we are excited again to explore Gunung Tujuh. The forest, the wildlife, and the charm of beauty cannot be talked in words, but we can prove it with behind the lens. This morning we are satisfied to enjoy the seven mountain paradise. It is the time we returned to the edge of the lake and we will walk through the forest. We walked along the path made by the inhabitants. 1 hour we walked, we found a new deer body. Seeing the condition of the deer body, we immediately moved away because the beast just had breakfast. We do not want to disturb the forest dwellers this morning. Rain bushes came. Soon we had to walk to get to our destination. Not easy through the forest in heavy rain conditions. Sure enough, this is called the tropical rainforest. Over 12 hours we walked and finally, we arrived at Pelompek. 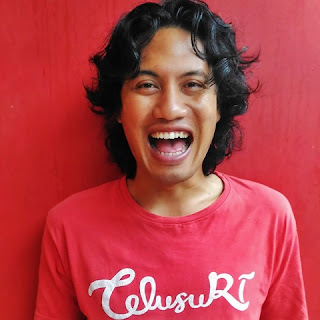 Gunung Tujuh, there is a mystery that we will save.